How much do you know about “Back to the future”? I had to take a day trip to Penang by semi-luxury express bus recently from my home in Subang Jaya near Kuala Lumpur which was five hours each way. The bus was installed with media entertainment akin to what your can find on airliners. After exhausting the current/latest hits of movies on offer, I decided to rewatch the classic 1985 sci-fi, “Back to the future” (BTTF). The first time I partially watched BTTF was in 1986 when I worked in a summer camp tucked in the Pocono Mountains of Pennsylvania, USA as the baker’s assistant. But, as the film was shown to the campers, naturally workers like me who had to bake some cookies for the campers did not get to watch the entire film. It was sometimes in the late 1980s when I was working on my doctoral studies in Belfast that I had the chance to fully watch this action-packed, cleverly-plotted sci-fi aired on one of the TV channels. This film was the first of a series of 3 that was produced and I watched them all. The best, as far as I am concern is still the first BTTF. I found this sci-fi one of the best scripted shows I have ever watched. If you watch all 3 films in the BTTF series, you will be impressed by the way all the plots seem to be seamlessly weaved and intertwined together. In this festive season, I think I should put up a small quiz for my readers on BTTF. I promise to publish the answers in my next posting! Enjoy the challenge! What is the name of the band engaged to play in the Enchantment Under The Sea dance in Marty’s school in 1955? _________________. Doc Emmet Brown of the 1950s did not believe that Ronald Regan was the President in 1985. Who did he mention as (a) the Vice President? __________________ ? (b) The Secretary of the Treasury _____________? When Marty bumped into his dad, George McFly of the 1955 at Lou’s Cafe for the first time, what did George order? _____________________________. Why band members could not get Marty out of their car boot/trunk after Biff Tannen pushed Marty inside it? _________________________________________. What did Lorraine Baines (Marty’s “future” mother) say when she kissed Marty for the first time? ___________________________________. What was written on Marty’s sister T-shirt in the photograph of the three McFly siblings? ______________________________. The band leader of called someone after hearing Marty McFly play “”Johnny B. Goode”. Who did he call? What was his relationship to this person? (a) ____________; (b) ___________. What mischief did Marty get into when he was eight years old? _____________________. 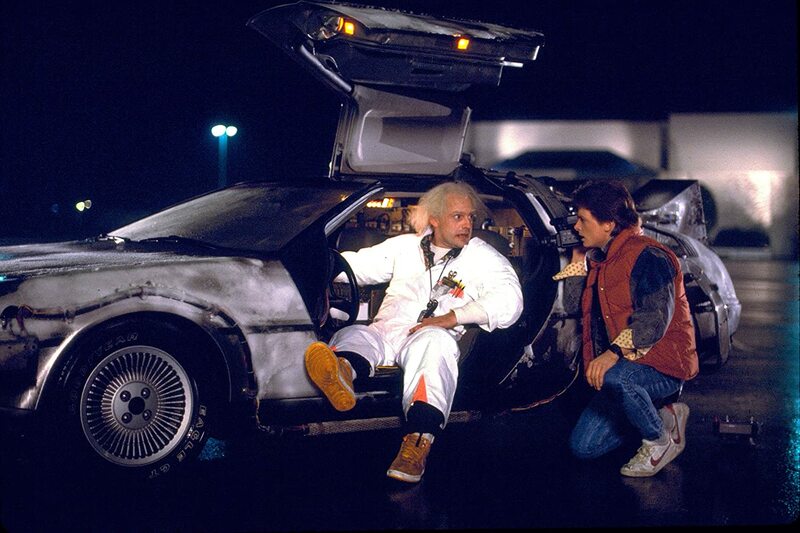 From 1955, what date and time that Marty originally set in the DeLorean car to travelled back to the future? ____________________________________________. What are the names of Marty’s elder siblings? (a) ______________ & (b) ____________. What are the names of Marty’s uncles and aunts? (a)_____________; (b) ______________; (c)___________________; (d) _____________________________. What colour was Marty’s underpant when he time travelled back to 1955? ______________. What were the parameters that the DeLorean car must meet before Marty could get back to 1985? (a) ____________; (b) ______________; (c) ____________________. What was the name of the shop that Marty parked Doc Brown’s car just before he was supposed travel back to the future in the DeLorean car? __________________________. When Marty finally managed to travel back to 1985, he found that things had changed. What was the name of the book that his father just published? _________________________. What was the name of the motel in the main street of Hill Valley? ____________________. What was the actual date and time that Marty finally managed to return to the future? Don’t rely on traditional banks for international remittance! Bye Bye Unifi, Hello Maxis Fibre!